The Big Sea: Words and Punctuation!! 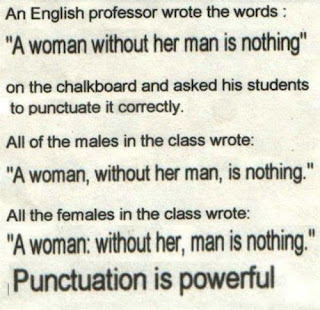 I absolutely love language and punctuation; it is so powerful! 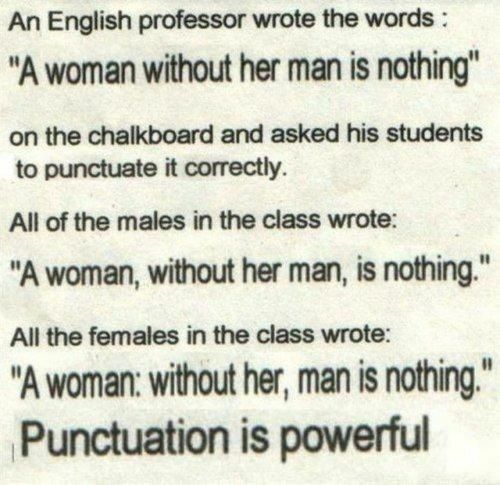 When I received the above example of how language and punctuation can be manipulated to convey so many messages; I just had to smile. When I think about how carefully author chooses words and punctuation to convey their messages, it completely leaves me in awe. "The North Carolina Mutual Life Insurance agent promised to fly from Mercy to the other side of Lake Superior at three o'clock." It would be a shame to read any of Toni Morrison's books and not notice and appreciate every sentence, in just the same way that it "pisses God off if you walk by the color purple in a field somewhere and don't notice it" as stated in the novel The Color Purple. Today, I am so loving words and punctuation!!! !